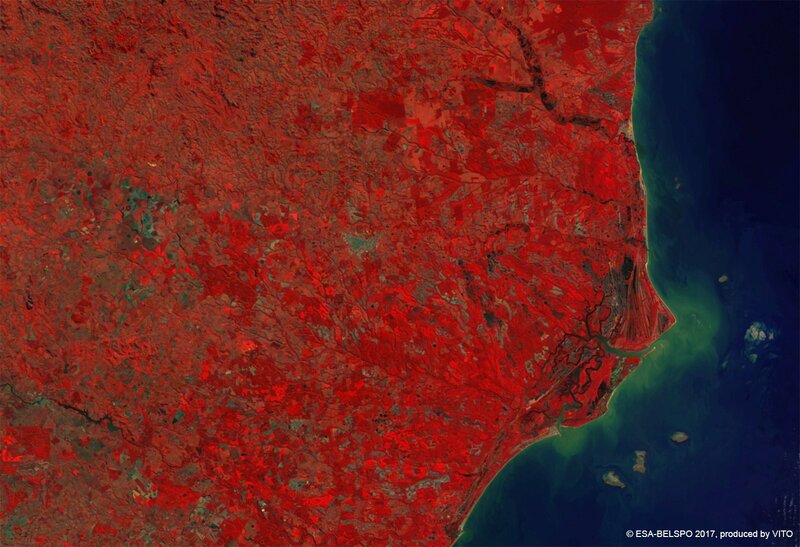 In celebration of March 21st as the international Day of the Forests, PROBA-V zooms in on the extractive reserve of Cassurubá, that covers the Caravelas River estuary along the southeast coast of Bahia, Brazil. This reserve was created in 2009 to protect the livelihoods and culture of the local people and protect natural resources such as the mangrove forest, remnants of the Atlantic Forest and coastal marina environments important for whale nursing. The Atlantic Forest biome, as true tropical forest, extends in latitude as far as 24°S due to trade winds and higher amounts of rainfall. This coastal rain forest is among the richest in biodiversity and endemism in the world. The eight Discovery Coast Forest Reserves in this ecoregion contain around 20% of the world’s flora in an area of 120 000 hectares, including 627 species of endangered plants.